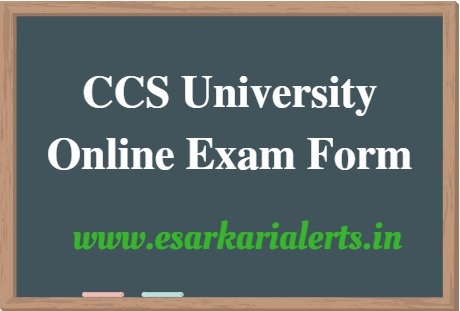 The students, who are pursuing in any course from a CCSU affiliated college, are informed that the Chaudhary Charan Singh University has recently notified that the CCS University Online Exam Form 2017 are available from the 3rd/4th week of October 2017. In order to take part in the CCSU Main Exams 2018, it is necessary for the candidates that they fill the CCSU Online Examination Form 2017-18 on or before the last date of applying. Latest: The Chaudhary Charan Singh University has started the online process for the Main Exam Forms for various UG & PG Self-Finance Courses and UG (Mains) B.A., B.Com and B.Sc. First Year. Recently, the forms for First Semester/ Year are being invited by the University on its web portal. Check the below-given notification's PDF to know the name of these courses. These forms will be filled from 23rd October to 7th November 2017 and you can submit your from in your college on or before 8th November 2017. For Further updates, keep visiting this page. Highlights of this Page: CCSU Online Exam Form 2017-18, CCS University Online Examination Form 2017-18, CCSU Regular Exam Form 2017-18, CCSU Private Exam Form 2017-18, CCS University UG Online Forms 2017-18 and CCS University PG Online Forms 2017-18. The candidates who are pursuing in regular courses like BA, B.Com, B.Sc, MA, M.Sc, M.Com etc. they are necessitated to submit the CCSU Regular Online Exam Form on the official website of the Chaudhary Charan Singh University. After submitting the online form, the students are required to submit the hard copies of their form in their college before the closing date of submitting the form. Few documents will be attached with your form. So, please check the list of required documents that is furnished below on this page. The aspirants who are not pursuing in any UG/ PG program in any CCSU affiliated college they can submit the CCSU Private Online Exam Form to be eligible for the CCSU Main Exams of session 2017-18. After completing the online application process, the students will have to submit the hard copy of their form in the related college along with the copies of required documents. The UG (Under Graduate) courses include BA, B.Com, B.SC, BBA and many others. 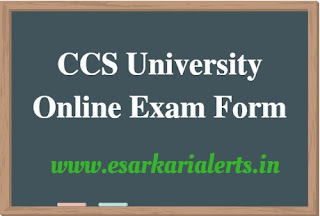 The candidates who want to appear in the final exams of these courses they are necessitated to submit the CCS University UG Examination Form on or before the final date of the submission. The university will also invite the CCS University PG Examination Form for various PG (Post Graduate) courses like MA, M.Com, M.Sc etc. Only those students will be eligible for the CCSU PG Exams who have submitted their forms before the final date. So, candidates, submit your forms as soon as possible. Examination Fee: A required amount of examination fee is required to be paid by the students via the internet banking/debit card/credit card. The amount of examination fee will be mentioned in the official advertisement. Required Documents: Following documents are necessitated to be submitted by the students at the time of online application.